Donald Trump does not like most of the 1.8 million people who work under him. In part, that is due to his belief that many of them are part of the "deep state" that is out to get him. Another element is that when he was a real estate developer, regulators and other bureaucrats were the opposition. Probably also playing a role is the fact that the path they have taken with their lives (public service, moderate salary, etc.) is antithetical to what Trump thinks is worthwhile. He's looked down on non-wealthy non-entrepreneurs all his life, and there's no reason to think that changed when he moved into the White House. So, it's not too shocking that on Thursday the President announced he was canceling the 2.1% raise federal employees were supposed to receive in January, declaring that "federal agency budgets cannot sustain such increases." The total cost of the raise: $25 billion. There is zero chance that Trump has suddenly become a budget hawk, given how willing he's been to blow millions or billions of dollars on other projects, from the Mexican wall, to unnecessary military parades, to a massive tax cut that makes $25 billion seem like pocket change. No, this is part of a sustained assault on the federal bureaucracy, one that also includes leaving key posts open for months and months, appointing leadership that knows little to nothing about the departments they manage (we're looking at you, Ben Carson, Rick Perry, Betsy DeVos, et al. ), and issuing executive orders designed to cut federal employees' unions off at the knees (all of which were overturned by a judge last week). Politically, it is hard to see how this benefits Trump and/or the GOP, since saving $25 billion is a relative drop in the bucket, especially when it means taking barely enough money to keep up with inflation out of the pockets of hardworking folks who (largely) do thankless jobs. On the other hand, it's pretty easy to see how this could backfire. To start, there are some of the less-than-pleasant juxtapositions it sets up. Like, for example, that the GOP can find $1.5 trillion to fund tax cuts, where 83% goes to the wealthiest 1% of Americans, but they can't find $25 billion for middle-class federal employees? Or, to take another example, that the billionaire Trump, who has never wanted for anything in his life, can callously deny a relative pittance of a raise to people who may well be living paycheck-to-paycheck. In another move that is supposedly about saving money, but really isn't, Donald Trump announced plans on Thursday to cancel all U.S. funding for the United Nations aid program for Palestinian refugees. The administration will also call for a 90% reduction in the number of people recognized as refugees, from 5 million to 500,000, and will soon announce its own "peace plan" for Israel. The move, if it is carried out, will save the federal government about $350 million a year. Actually, that is what it would have saved under Barack Obama. Since Trump already cut the payments by half, it will save something like $180 million. That is to say, about .00434% of the federal budget. By comparison, the U.S. sends about $40 billion per year to Israel, or abut 222 times as much as it spends on Palestinian refugees. The real purpose here, of course, is to please the same folks who cheered the relocation of the U.S. embassy from Tel Aviv to Jerusalem. That includes Christian evangelicals, Islamophobes, and right-wing Jews (read: Sheldon Adelson). Experts are in agreement that the consequences will be significant, increasing suffering among the people the money is supposed to help and, consequently, increasing the amount and the severity of violence in the region. In turn, it will make a "solution" to the situation all the more difficult, particularly given that Trump clearly intends to offer up something very one-sided. The dramatic reduction in the number of people allowed to request asylum in the U.S.
On the latter point, incidentally, the Washington Post's original reporting on the story went along, in part, with the administration's claim that they were just continuing a Barack Obama-era policy. That turns out to be false. The policy was first implemented during the Bush Jr. years, started to tail off, was killed off entirely (and quickly) upon Obama's assumption of the presidency, and was resurrected by Team Trump. [Trump's lawyers believe] that if Mueller wants to build an obstruction case around [AG Jeff] Sessions, he has the fodder he needs in the form of a January 2018 New York Times report indicating that the president instructed White House counsel Don McGahn to prevent Sessions from recusing himself—and that Trump aides have talked with Mueller about the episode. The drumbeat of presidential tweets denigrating Sessions as "weak" and calling on him to "stop this Rigged Witch Hunt right now" have also shaped the view among the president's legal team. They have come to believe that if Mueller wants to build a case that the president has intimidated his attorney general, he can do so given the voluminous public record created by the president—and that firing Sessions won't change much. The "fudged" tape that Trump is referring to is the interview where he admitted to firing James Comey over the Russia investigation. It was not fudged, of course. What it is, however, is a pretty big piece of the obstruction puzzle, which is why Trump is desperately trying to discredit it. The new version of events—that Trump decided to can McGahn—presents two (or possibly three) problems for the President. First, because it looks to be linked to McGahn's conversations with Mueller, it adds to the obstruction case. Second, given that Trump apparently lied about McGahn's departure, it may add to the cases against him for both obstruction and conspiracy. And finally, McGahn's staff is very loyal to him, and many may decide to exit along with him. Not Enough Lawyers: At the outset of the this administration, the White House counsel's office had 35 lawyers. It's down to 25 now, and will drop to 22 by the end of September. Friends of Trump recognize that is barely enough to handle matters as they currently stand, and it will be far, far short of enough if the Democrats gain control of the House and begin peppering the White House with subpoenas and document demands and the like. And then there is the President's personal legal team, which is already outmanned and outgunned, and is also likely to have vastly more work to do in upcoming months than they have now. Television lawyer Rudy Giuliani is essentially useless for any serious defense work, while Emmet Flood is currently the favorite to replace McGahn. Jay Sekulow can't do it all alone, but, as has already been demonstrated, very few top-flight lawyers want to work for a fellow who does not follow advice, and who has an itchy trigger finger when it comes to firing counsel. Given the dire straits that are presenting themselves, Trump is thinking about poaching Abbe Lowell, who currently represents Jared Kushner. Whether Lowell would agree to take the job, and whether or not it would even be ethical for him to do so, are excellent questions. As noted above, Team Trump thinks that the legal damage that would be done by firing AG Jeff Sessions is a non-issue because that ship has already sailed. Meanwhile, whatever political damage might be done will essentially be moot after November 6. So, it seems probable that Sessions' last day at work will be November 7, give or take a few days. Just in case there was any doubt on that point, Donald Trump himself effectively confirmed Sessions' drop-dead date in an interview with Bloomberg on Thursday, in which the President committed to keeping the AG until the midterms, but absolutely refused to answer a question about keeping him after that. Much like the Full Sherman, any answer other than "I'm absolutely, positively going to keep Sessions around" means "He's outta here." Gillum did a particularly good job of turning out minority and young voters, which pollsters' models did not anticipate. Gillum was courting segments of the electorate (black voters, progressives) that the other candidates basically did not contest, as they fought tooth-and-nail over the white suburbanites, the centrists, older Democrats, and Latinos. Primary electorates are small and idiosyncratic, and that can be hard to account for. Because primaries do not attract the interest and money that general elections do, pollsters have to work on the cheap, which means computer surveys and the like. These are far more prone to inaccuracy. Because primaries are not "final," voters do not truly commit to a candidate until late in the process, maybe not even until they're in the voting booth. The race was both crowded and very close, which allows late swings in support to have an outsized effect. Some of the big events in the race, like Sen. Bernie Sanders' (I-VT) involvement, happened too late to be captured by polls. The latter point could prove to be the most important one in 2018. Cruz is going to turn out a certain subset of the electorate, one that skews fairly old and fairly white, and that's about it. That means his kryptonite is a young, charismatic candidate who can get unusually high numbers of young and minority voters to show up to vote. Rep. Beto O'Rourke (D) is looking more and more like he might be that guy, as polls of the race get tighter and tighter. There are few people who look good in a shirsey. 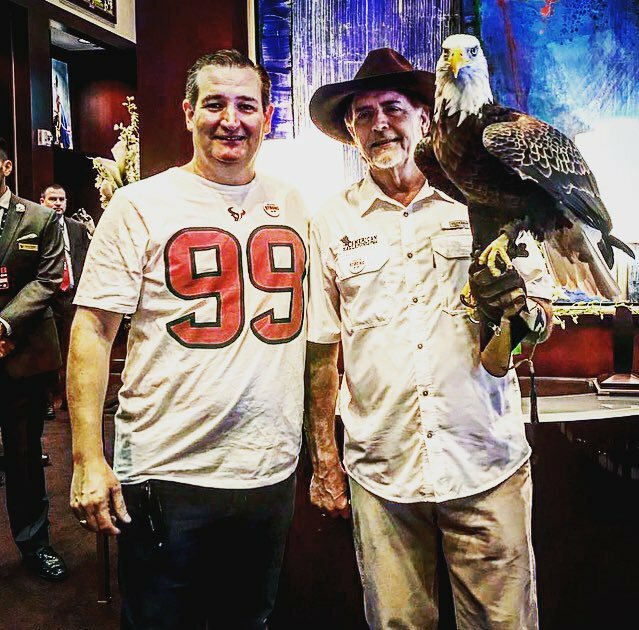 Ted Cruz is not one of those people. That picture is only a tad less awkward than the famous one of Nixon and Elvis. When it comes to the House of Representatives, the GOP knows that they are in desperate times right now, given the general dynamics of midterm elections along with the historic unpopularity of the man in the White house. They have made clear that they will use every trick in the book to try to save their majority, and if there were any doubts about that, Abigail Spanberger can lay them to rest. Spanberger, who once worked for the CIA, is the Democrat who is trying to knock off Rep. Dave Brat (R), the Freedom Caucuser who won a surprise victory over then-House Majority Leader Eric Cantor in 2014, but who might be a bit too conservative for his R+6 district these days. Spanberger says that GOP super PACs unethically acquired a copy of her federal security clearance application, and they are now trying to use her personal information against her. The GOP super PACs, for their part, do not deny the story, other than the "unethical" part. They say they got the document through a standard federal records request, a story that experts find dubious. Spanberger has also been targeted for some particularly vicious push polling, a technique in which partisans spread propaganda in the guise of a supposedly unbiased poll. One of the questions, for example, asked if the respondent knew that Spanberger once taught at the Islamic Saudi Academy in Alexandria, Va., and that numerous students at the academy were "arrested for terrorism." It's true that she taught there, and that a handful of alumni were arrested, but there is of course zero evidence that any of the students were in her classes. And even if they were, are all of Timothy McVeigh's teachers forever barred from holding office? Or the Unabomber's? Or Robert Hanssen's?